Cichlids are fish native to tropical freshwaters in America, Africa and Asia. The small varieties are popular aquarium fish. While many different diseases afflict cichlids' entire bodies, certain diseases affect their eyes. Bulging eyes, cloudy eyes, or growths of cotton-like tufts over the eyes are all signs of eye disease in cichlids. Note that cloudy eyes are also sometimes a sign of a fight with another fish, according to cichlidresearch.com. Exophthalmia, commonly known as Pop-eye, is a disease characterized by bulging eyes. Ichtyophthirius is a disease that shows itself with white, salt-like deposits all over the fish's body. If your cichlid has Ich, as it is commonly called, its eyes will appear cloudy..
Parasites, fungi and bacteria are the usual causes of diseases in cichlids, according to cichlid.infocrux.com. Cichlid.infocrux.com recommends salt treatment for most diseases, but no treatment is guaranteed to work. 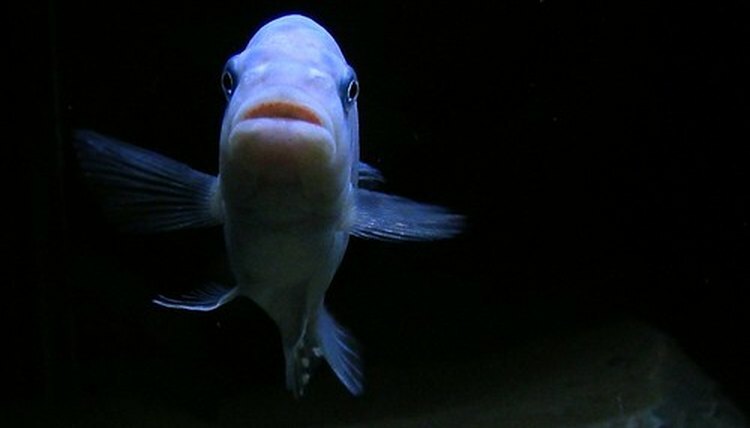 Separate your cichlid from the other fish in a quarantine tank to administer this treatment. To treat Ich, cichildresearch.com advises an immediate addition of Ich medicine to the tank, with daily applications for up to a week. Cleaning your aquarium regularly is the best way to ensure your cichlid does not contract a disease.